Travel from Algeciras to Gibraltar. Compare and combine trains, buses and carpooling in one search. Find the cheapest tickets. What is the best way to get from Algeciras to Gibraltar? Due to border checks to vehicles when crossing from Spain to Gibraltar, there is not any public transport service going from Algeciras into Gibraltar. However, the town of La Línea de la Concepción is at the Spanish side of the border with Gibraltar and it is much easier to cross the border walking than with a vehicle. 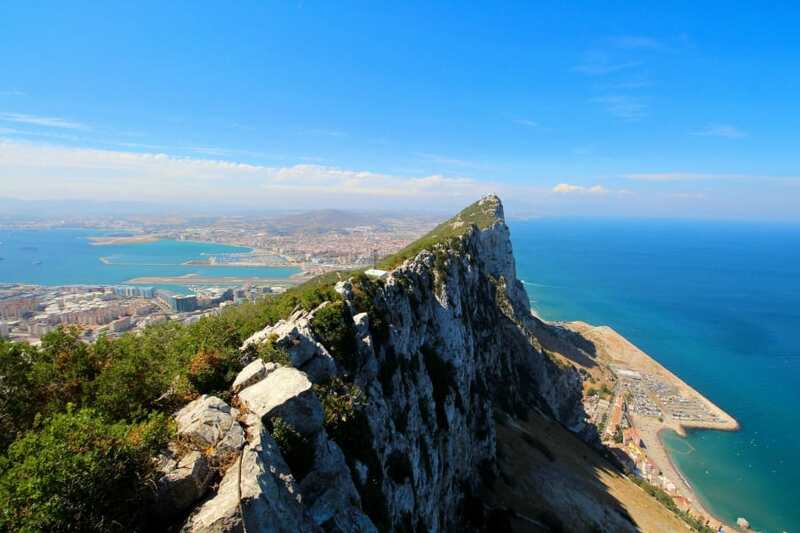 Therefore, the best way to get from Algeciras to Gibraltar is taking a bus from Algeciras to La Línea and then crossing to Gibraltar by foot. The best way to get from Algeciras to Gibraltar is taking a bus from Algeciras to border town of La Línea de la Concepción and then crossing the border to Gibraltar by foot. It is less than 1 kilometer (5 to 10-minutes walk) from the bus station of La Línea to the border. 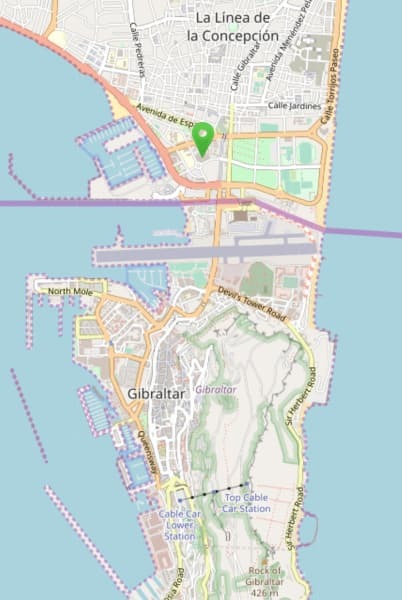 You will need to show your passport at the border and once you are in Gibraltar territory, you can either walk for other 15 minutes to the city center or take a bus (2€ per adult, 1.30€ per child). Comes is the company operating the route between Algeciras and La Línea de la Concepción. The journey takes 45 minutes and the price is fixed at 3€ per way. Tickets can be bought directly at the bus. There are plenty of buses running daily, the first departing at 07:00 and the last one departing at 22:30. During the week there is a bus every 30 minutes. At the weekend, as you can see in the timetable, there are less frequencies, but still very well connected, buses running every 45 minutes. It is not possible to get to Gibraltar from Algeciras by train. Neither Algeciras nor La Línea de la Concepción have train stations. A distance of 19 km separates Algeciras from Gibraltar. This can be covered by car in about 25 minutes with normal traffic conditions. If money is not an issue, there is also the possibility to take a taxi. This option is very flexible regarding times and as hassle-free as you can get. Radio Taxi Algeciras is the main local company. You can just pick-up a taxi whenever you need one, or you can book it in advance either by calling or through Whastapp. Note that if you take a taxi at the weekend, on a festivity or during the night, a special tariff will be applied, being about 5€ more expensive than the normal one. As alternative to a taxi, you can also book a private transfer. Several companies offer this service. Two of them are Airport Taxi Transfers and Epic Transfers. If you have a car, it is recommended that you leave it in La Línea in order to avoid all the troubles (and queues) of crossing the border with a vehicle. Driving your own car will cost 3€ for fuel consumption, according to Via Michelin. However, you will need to add also the cost of the parking. Parking lot Alcaidesa Marina has reasonable fares, with prices for 24h starting from 9€. Other parking lots can cost as much as 17€/day. There used to be a ferry connecting Algeciras and Gibraltar twice per day, taking 20 minutes to cross the bay. The service was operated by Transcome Lines between end of 2009 and beginning of 2012, when it was discountinued due to its low demand. If you are travelling to Gibraltar, you might be interested in looking for accommodation. Keep in mind that accommodation in Gibraltar can get pretty expensive. If you do not find any option fitting your budget, check also accomodation in La Línea de la Concepción, as it is usually much cheaper. By using the search box below you can find the best prices in several types of accommodation, from low-budget hostels, to appartments and fancy hotels. The sooner you book, the cheaper it will be. In some cases you might have free cancellation under certain conditions! Gibraltar. Photo from lutz6078 on Pixabay. Map of Gibraltar and La Línea de la Concepción, highlighting its bus station. Source: © OpenStreetMap. Road map from Algeciras to La Línea de la Concepción and Gibraltar. Source: © OpenStreetMap.